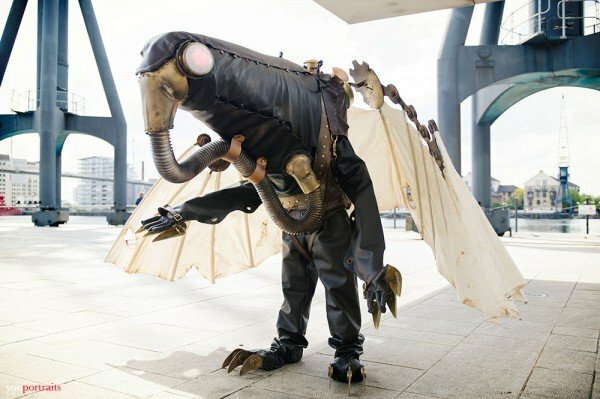 Building Songbird from BioShock Infinite « Adafruit Industries – Makers, hackers, artists, designers and engineers! Songbird of BioShock Infinite creeps me out. The scary construct was Elizabeth’s protector, and cosplayer kaasutii built a pretty spot on version of the creature last year. Construction of the costume took about two months and involved materials such as wood, metal, and Worbla. The head is a wire frame attached to a backpack for a harness, and it looks like it’s a challenge to wear. She got around just fine though and did a fantastic job with the build. 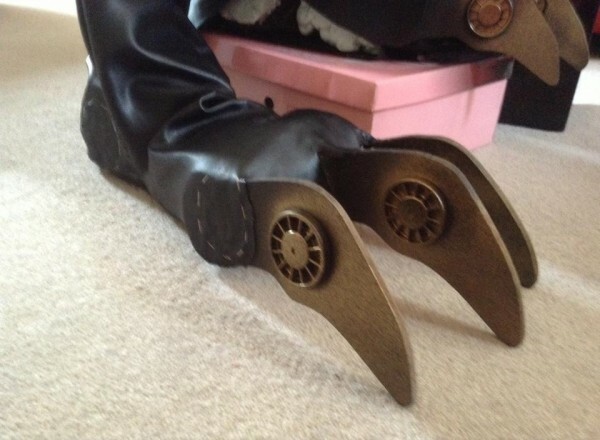 Here is one foot, they are attached directly to the leather trousers. The claws are made from wood and the sprayed gold and black. There is a boot inside with I sprayed and carved expanding foam on to make them bigger and the correct shape. I then hand stitched the leather around. I love this costume as the more hand made it looks the better! As the songbird was a man made creature after all. Read more and see more pics at Cosplay Island.